From a young age, Chris Whittaker was introduced to local food by his grandparents when he was taught to respect how we catch, conserve and grow our food. Home was Thunder Bay, Ontario where trucks, a case of beer and baseball caps were rights of passage. The result? A gut level understanding of sustainability and a low tolerance for pretense. Since coming to The Listel Hotel in 2007, Chris has garnered praise for his playful yet sophisticated cooking style and his passion for local products and ethically sound ingredients. He has been the driving force behind the restaurant’s participation in the Ocean Wise program and the Green Table Network resulting in O’Doul’s receiving the inaugural Green Table and third annual Sustainable Seafood Where to Dine Award in 2008. 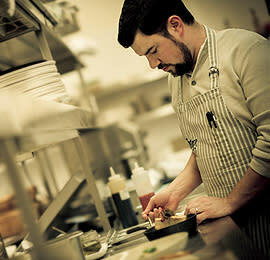 He is an active board member of the prestigious Chef’s Table Society of BC. And now there is forage. Chris has been a driving force behind the philosophy of forage. Teaming up with Green Table Network, BC Hydro, LiveSmart BC, forage is a showcase project on how to achieve financial savings through high efficiency, leading edge technology. Reducing energy and water consumption by 30% in both the kitchen and front of house, and maintaining Chris’ own food viewpoint of local and sustainable, forage is a dream come true for this highly motivated chef. At his home in Maple Ridge, Chris is absorbed in keeping his compost pile cooking, his mason bees pollinating and getting up to speed on BC’s fish and wildlife regulations. My first job was doing dishes and washing pots. I was so fascinated watching the mechanics of a really busy kitchen. All I could think about was putting on one of those white coats and taking off my orange gloves...I was hooked from the first chicken breast I breaded. I think that staying connected with my suppliers plays a huge role in this for me...they are all so passionate about their products...it really inspires me. What is your most valued tool in the kitchen? What is your favourite guilty-pleasure food? What is the best compliment you could receive from a customer? I really like it when they mention that something about one of my dishes triggers a fond memory from their life. Food is such an important part of who we are. As a new restaurant we are really excited to see many new faces try out forage. If you could give just one cooking tip, what would it be? Please buy a probe...please do not ask me every single year how many minutes per pound you should cook your turkey...please. Who has been an influence on your style of cooking? Mother Nature...I rely heavily on the growing seasons!